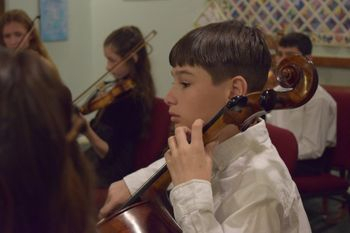 The YSYS Intermediate Orchestra is a new branch of our organization which we started in September of 2014. The Intermediate Orchestra is an orchestra for students who are new to orchestra playing and would like to gain experience playing in a classical group setting. The orchestra will rehearse from 7:00-8:00pm on Tuesday nights at Yuba City High School, and will be directed by Jan-Roberts Haydon. their school or private music teacher. We strongly suggest that students be graduates of Suzuki Method Book 1, or at an equivalent level. Students will not have to audition, but will need to complete a written recommendation form from their school music teacher or private music teacher (see below). Tuition for the Intermediate Orchestra for the 2018-2019 year is $60. Checks should be made out to Yuba Sutter Youth Symphony. Please mail the application below and the $60 tuition payment to Helen Graham at 877 Jewell Ave. Yuba City, CA 95991. All events and dates on the YSYS Calendar will also apply to the Intermediate Orchestra unless otherwise noted.